For all you monogram lovers out there, I’m really excited to share today’s article with you! 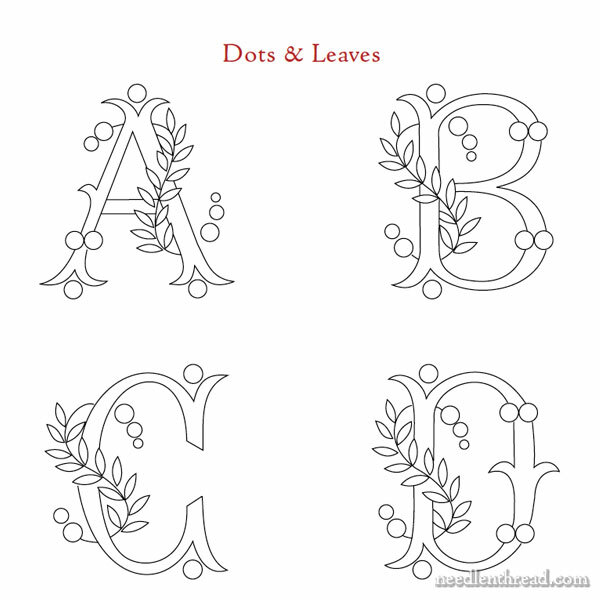 Ever since I first started posting monogram alphabets on Needle ‘n Thread, I’ve had requests to make the whole alphabets available in one PDF, so that they were easy to download and organize, to pull up whenever you need a pretty letter to stitch. Finally, I finished doing that – and not only with the monogram alphabets you’ll already find on Needle ‘n Thread, but with a heap of other alphabets, too! 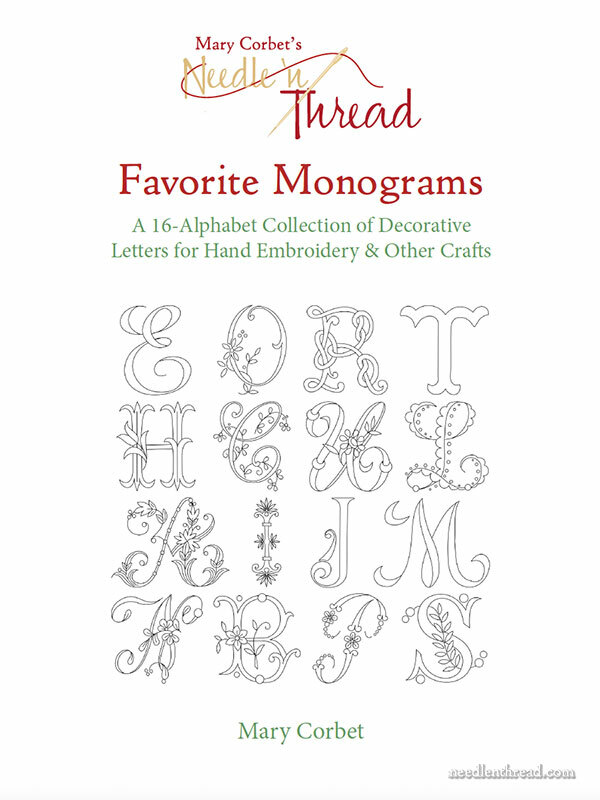 Favorite Monograms is a design resource in PDF format, featuring 16 complete monogram alphabets perfect for hand embroidery and other craft uses. Each letter in each alphabet has been carefully traced into a clean line drawing that can be enlarged or reduced on your home printer or a photocopier to suit your particular stitching or crafting needs. The alphabets print straight from the PDF at 2.5″ high, if you choose “no scaling” or “100%” in your printer settings, making them just the right size for most hand embroidery applications. But if you want to go big or you want to go small, you can do so easily by enlarging them or reducing them. Either way, you’ll have nice, clean lines to use for embroidery. Most of the alphabets originally come from my collection of antique publications, many of which are frail and crumbly, so scanning them and re-tracing them was a way to preserve the alphabets. 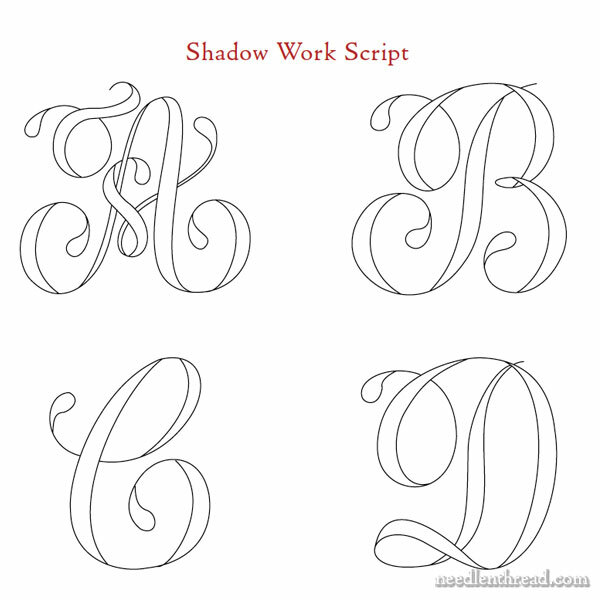 Some of them come from hand-written calligraphy samples that translate into perfect letter shapes for plain monograms. These simpler alphabets are ideal for voided embroidery (where the embroidery is done around the outside of the letter and the inside is left blank), for free-style colorful filling (like these magnificent embroidered letters that I mentioned last weekend), for shadow work, or just for simple, minimalist stitching. Why Clean Up the Alphabets? Why clean up the alphabets if they’re scanned straight from the old publication? Working directly from a scan is not always ideal. Often, the design lines are fuzzy. And besides the loss of resolution when a design is enlarged – or the often garbled look when reduced – scans usually offer a lot of extra “noise” like discolored backgrounds, speckling and so forth that interfere with a clean print of the design. The letters in Favorite Monograms offer pristine backgrounds and clear lines, so you can work with them easily. 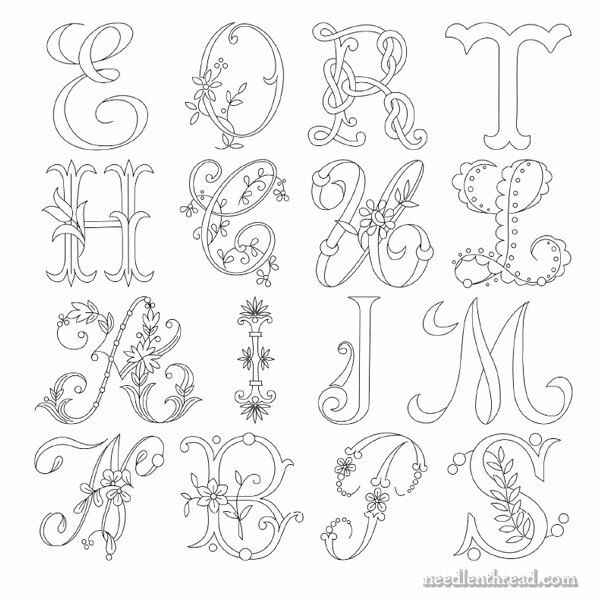 There are 16 complete alphabets in the e-book in a wide range of design styles: florals both delicate and bold, scallops, plain lettering, twisty knot work – there’s something for every taste! Often, in old publications, monogram alphabets are not complete. Certain letters like I and J, for example, were used interchangeably. Sometimes, publishers expected artists to use M and W interchangeably. Sometimes, less frequently used letters (like X or Z) were simply omitted. In alphabets where letters were omitted from the originals, I’ve drawn the missing letters to match the rest of the alphabet. Monograms are a wonderful way to personalize items from accessories and clothing, to quilts, tea towels, and the gifts that you give to others. 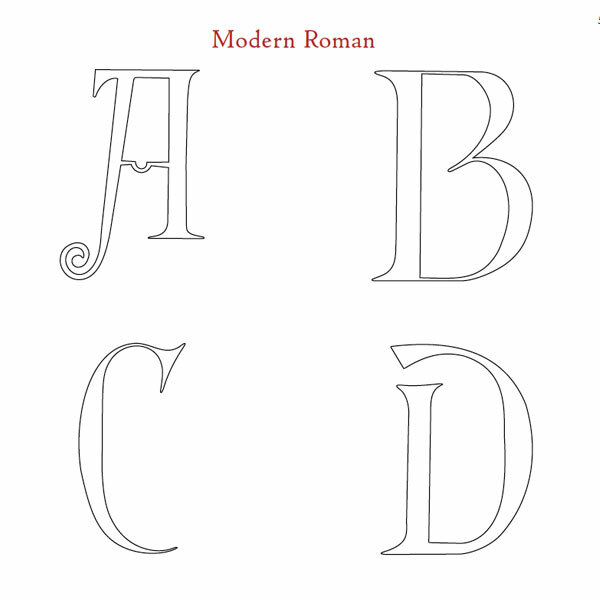 At less than $1 per alphabet, Favorite Monograms is a useful, fun, and affordable design resource to have at your fingertips when you’re ready to add that perfect personal touch to your work! You can find Favorite Monograms available in my shop, along with all my other e-books. Shortly after your order is placed, you’ll receive a download link in your email inbox. Please double check your email when completing your purchase, to ensure delivery. Please download your e-book (PDF) directly to your computer or laptop as soon as possible after you’ve received your download email. Once you have the PDF on your own computer, you can then move it to external devices like tablets and mobile devices, by syncing your device and computer according to your tablet’s particular instructions. This will ensure that the PDF is securely loaded on your external device and also securely saved on your computer for future use. If you have any problems with downloading or saving the PDF, no worries! Just drop me a line and I’ll help you through it. If you ever lose your e-books purchased through Needle ‘n Thread, that’s ok, too. Just drop me a line and I can look up your order and send it again. Now, go forth and get your copy today – and I promise I’ll love ya forever! Two posts in a row – what a treat! Thanks for sharing Mary. Mary, This collection is wonderful. Thank you so much. I have been looking forward to this publication since you first told us about it and it was definitely worth the wait! The download was so easy. Thank you for this alphabet treasure. I have all of your ebooks and this is one of the best. By the way, I have been collecting archived monograms for a while and they are NOT very usable without significant cleanup. Thanks again! What a great ebook. Just got my copy. Talk about “INSTANT” download. Don’t think I had time to blink before it showed up in my inbox. Have a niece heading off to U of M this fall so between this ebook and the Alphabet Sampler book I’m ready for some fun! Thanks so much for all you do! Just got it! So great to have all the letters in one place to drool over! Thank you so much for all your hard work to clean these up. Looking forward to trying my hand at a shadow work sample. I’ve never tried it and this looks to be a great way to get started. Thank you for another excellent publication, Mary! Keep them coming and I’ll promise to love you back :). Beautiful!! Each one is wonderful. I love them all!! Thank you, thank you, Mary. Just purchased the e-book and browsed through it, it’s lovely all those wonderful different types of monograms which are lovely. I can’t wait to try them and it’s great to have monograms all in one place where you can browse and pick which one to embroider. Thanks for creating the monogram e-book and sharing it with us again a great bargain and lovely designs. I just downloaded the Favourite Monograms Collection, and it is just beautiful! It’s hard to know where to start, and the variety is wonderful. You have done such a fabulous job of cleaning up and presenting each set, and it’s a treasure. You might enjoy these lettering styles–quite a variety! Thank you just downloaded my copy and love it. Beautiful book, Mary! Definitely going to purchase one! Wonerful, thank you, and instant delivery! Sorry, that should be Wonderful! You can see I was excited to get this! Thank you, Mary. This is wonderful! Bought it immediately, and wow! Mary, that must have been a lot of work. I’ve cleaned up scans of old magazines and it’s not an easy or quick job. Thank you so much for doing this! Received my copy of assorted monograms last night and it was almost like reading from a cloud. I love monograms and having them all in one set is wonderful. Hi, Mireya – I haven’t considered making the alphabets available individually. All of the alphabets – and really any monogram alphabet – is suitable for beginners. It’s not really the shape of the letter that dictates the complexity of the technique. It’s the technique that determines the complexity or level of stitching. In the upcoming weeks, I’ll be sharing some varied approaches to monogramming, that anyone can do, for beginners and beyond. So you might want to keep an eye out of those articles – they’ll include ideas and tips, and they’ll be a lot of fun! Definitely something that beginners can handle. Previous Previous post: Forget the Adult Coloring Books – This is Much More Fun!